According to CNN, Reuters, AP News, the NYT, and other media, the Saudis will admit responsibility for Khashoggi’s death. Citing unnamed sources, media reports claim Riyadh will say he died during a botched interrogation and plan to abduct him, what happened conducted without kingdom permission, parties involved to be held responsible. One report, citing an unnamed individual familiar with Riyadh’s plan, claimed crown prince Mohammad bin Salman (MBS) approved Khashoggi’s interrogation and abduction, the kingdom to try absolving him of responsibility for his death, shifting blame to an unnamed intelligence official. Why would Riyadh have dispatched a 15-member security team to Istanbul on the day Khashoggi disappeared inside the kingdom’s Istanbul consulate, returning less than 24 hours later, if not to abduct and eliminate him, clearly wanting his criticism of regime policies silenced. Trump said he saw the report. “(N)obody knows” if it’s official, he said, clearly wanting nothing interfering with longstanding US/Saudi relations. Pre-dawn Tuesday, Turkish anti-terror branch/crime scene investigators, and others left the Saudi consulate after a reported nine-hour forensic inspection. Ankara claims it has audio and perhaps other evidence proving Khashoggi’s murder inside the facility, Saudis responsible for what happened. Straightaway after his disappearance inside the consulate, there was little doubt about kingdom responsibility for his fate. The reported announcement coming clearly is a cover story to shield MBS and other key ruling family officials from what happened. “The kingdom affirms its total rejection of any threats and attempts to undermine it, whether by threatening to impose economic sanctions, using political pressures or repeating false accusations” – with no further elaboration. On Monday, Saudi-owned Al-Arabiya television suggested the kingdom could use oil as a retaliatory weapon. Cutting production could spike the price sharply higher ahead of US November midterm elections. Brent crude currently trades at around $80 a barrel. If Saudi production is cut enough, it might increase to $100 or more with potentially adverse economic effects worldwide. CNN said the report admitting kingdom culpability is being prepared with possible changes in its content before release. “I don’t wanna lose an order like that.” Separately he said it would be “foolish” to halt arms sales to the kingdom, adding “(n)obody knows” whether Saudis were responsible for Khashoggi’s fate. They “deny it vehemently,” he stressed, following a conversation with king Salman. If the above cited report is correct, the kingdom’s story is about to change, admitting responsibility for Khashoggi’s death after initially saying he left the consulate unharmed. Turkish sources called what happened to him “premeditated murder.” Clearly it appears that way. Western relations with the kingdom are longstanding. Its oil, super-wealth, large-scale foreign investments, and alliance with Washington’s war OF terror in Syria, Yemen, and elsewhere in the Middle East assure relations with Riyadh will remain unchanged – Khashoggi’s elimination a minor short-term disruption to pass. There’s little doubt about Saudi responsibility for his fate, mounting evidence likely proving it beyond a shadow of a doubt. In contrast, Russia, China, Iran, Syria, Venezuela, and other US adversaries face repeated unfounded Western accusations, no credible proof supporting them. Washington, NATO, Israel, the Saudis, and their imperial partners are responsible for high crimes of war and against humanity, yet remain unaccountable. Saudi oil and super-wealth buys lots of influence. 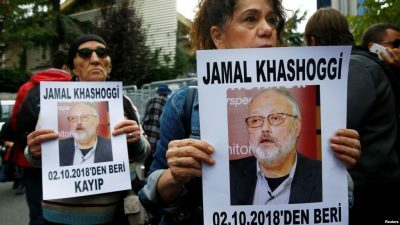 The US, other Western countries and Turkey won’t let Khashoggi’s fate disrupt relations with the kingdom. The current storm will pass once the issue fades from world headlines.